A note of contrition was written. New rhizomes were planted, but relations have never been quite the same. It still smarts. On both sides. People are passionate about their rhubarb. They may ignore it, let the stalks grow wild and unharvested. Still, they are fond of the idea of them. I have fond memories of my grandmother’s rhubarb. She used to give us the raw stalks from her June garden, along with a bag of sugar, and my brothers and sister and I would sit on her porch dunking and crunching while she made a pie. I’m pretty fond of what 3 Tarts Bake Shop on Wellington does with rhubarb and strawberries — that classic happy marriage. On a sweetcrust pastry (pâte sablée) the fruit bobs up from a buttery custard pond, their juices bursting on the surface. The tart is best served at room temperature. The second slice should be at room temperature too. 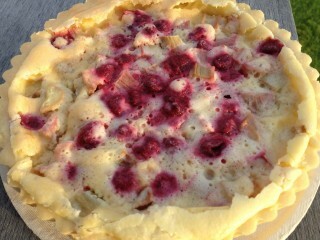 3 Tarts, 1320 Wellington St. W., 613-729-9832.